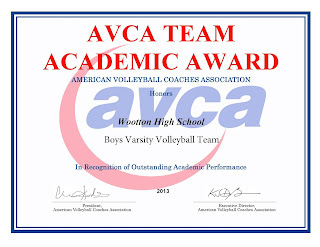 The Spring 2013 Wootton boys volleyball team has earned the American Volleyball Coaches Association (AVCA) Team Academic Award. We're one of only 23 high school boys teams to be honored with this national award for excellence in the classroom (a team GPA of 3.3 / 4.0 or above). 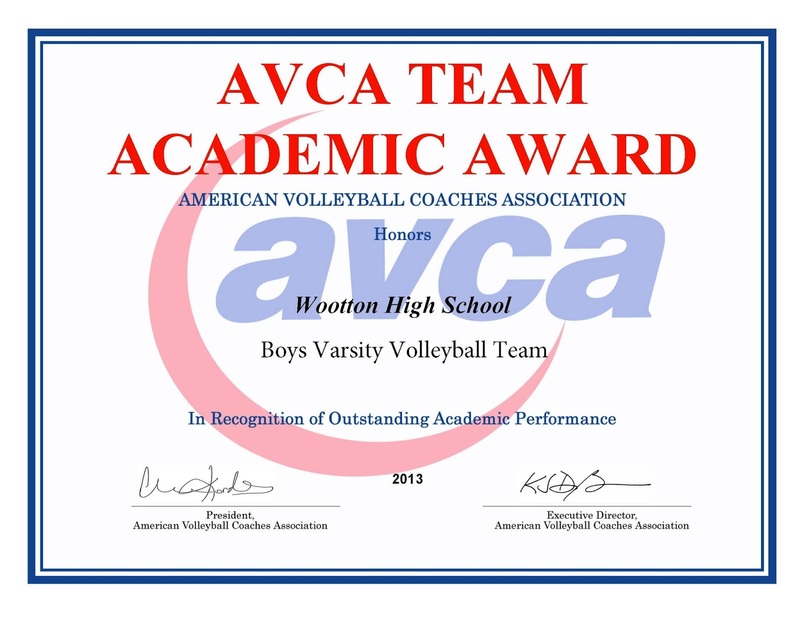 This award and a memorable 15-0 championship season affirm the success of Wootton's athletic program, and the boys are fine examples of the student-athlete ideal. 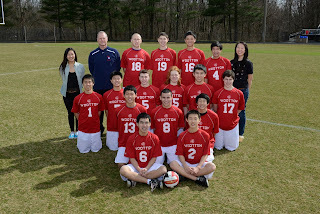 Freshmen: Aleksander Psurek, Henry Shu, Justin Wu. LEXINGTON, Ky. (August 7, 2013) - The American Volleyball Coaches Association (AVCA) announced today that 622 teams have earned the AVCA Team Academic Award for the 2012-2013 season. This number once again breaks the previous year's total of 536 and sets a new all-time high for this award. The AVCA Team Academic Award has become one of the AVCA's fastest growing awards programs, seeing an impressive surge in teams honored over the past several years. Since the 2000-2001 season, the number of recipients has increased every single year but one, while amassing an overall 300% increase over the span of the last decade. Since the award's inception in 1993, the amount of award winners has increased from 62 to its current number of 622. NCAA Division I recorded their highest-ever total number of recipients, honoring 130 programs while Division II surpassed last year's record of 69 winners with 77 this year. Division III also set a new record with 93 winners and the high school division increased their all-time high of 220 recipients to 253. Finally, the NAIA set a new record with 46 winners garnering the award. Prior to 2012-2013, only 16 teams had attained the pinnacle of volleyball success in both earning the AVCA Team Academic Award and winning their respective collegiate national championship in the same academic year. This year, the AVCA is proud to recognize two programs who excelled in the classroom and on the court: Concordia University-St. Paul (NCAA Division II) and Clearwater Christian College (NCCAA Division II). Over 1,000 different schools have earned the award in the program's 20-year history, with exactly 5,450 awards been given out in total. * Percentage is based on each category's breakdown of the total 2012-2013 Team Academic recipients. The AVCA, with its headquarters in Lexington, Ky., is managed by Associations International. The mission of the AVCA is to develop the sport of volleyball and its coaches. With a membership of over 6,000 and counting, the AVCA provides a professional network for those individuals and companies dedicated to enhancing and promoting the sport. Members include collegiate, high school, club, youth and Olympic coaches, as well as volleyball club directors. The AVCA provides education to volleyball coaches, recognition of elite players and coaches, promotion of volleyball competitions throughout the world, and networking opportunities for volleyball products and services providers. Further information is available at www.avca.org.